"[My works] were an emotional reaction to something I find beautiful in the subject, which provides the energy, the impetus to paint." "I sort of arrive at the final image in a paroxysm of despair." "I have always gone my own way. In a way it's been kind of a relief. Balthus once said of himself, 'I am a painter about whom nothing is known.' Of course, that's not really true of him. But it is of me." "My work was deviant enough to explain why I was not rising through the ranks. But I liked not having the demands made on me a big career would have made. It allowed me a certain freedom to fool around. I felt the other painters respected me. Nobody treated me like a dumb broad." "I'm quite willing to sacrifice fidelity to the subject to the vitality of the image, a sensation of the quick, lively blur of reality as it is apprehended rather than analyzed. I like to work on that borderline - opulent beauty in a homespun environment." "Realism is the only way I can do it.... Every so often I get an anxious feeling and would like to produce that bombed-out effect of modern painting. Maybe my form is too closed. I feel a certain desire for exploding a picture the way some artists do. Can you explode a painting realistically? I don't know." "To strain after innovation, to worry about being on 'the cutting edge' (a phrase I hate), reflects a concern for a place in history or one's career rather than the authenticity of one's painting." "As soon as I do something that seems very tenuous I get bored with it and when I get more and more specific I begin to feel sort of cloistered." "I feel very lucky to be a part of the whole tradition of art, which keeps reminding us of what it is to be a human being." Jane Freilicher, neé Jane Niederhoffer, was born in the Flatbush section of Brooklyn in 1924. The only girl in a large family, she was coddled by her parents. Her mother was an amateur pianist who played in silent movie theaters before marrying. Her father was an Eastern European immigrant and a Spanish- and Yiddish-language court translator. His love for his daughter's drawings "was a kind of encouragement to go into the arts," Freilicher remembered. In particular, Freilicher liked flowers; she remembered, "When I was a child my parents used to give me little bouquets. I liked to contemplate them, wonder about them." Her brother often brought home issues of Verve magazine, which featured high-quality reproductions of works by artists like Picasso, Matisse, and Miró, and she wondered if she couldn't make art a career for herself. After graduating high school (as class valedictorian) in 1941, she eloped with Jack Freilicher, a jazz pianist who played with the Army Band at West Point during World War II. Their marriage did not last long, however, and was annulled in 1946. Through Jack she met Larry Rivers, a painter and jazz musician with whom she was later romantically involved, and painter Nell Blaine. Freilicher attended Brooklyn College, earning her B.A. in 1947. Working towards her degree and now divorced, she did odd jobs, and she recalled, "Somehow I struggled through the lean years. It was fun - and a terrible hardship at the same time." At the urging of Rivers and Blaine, she relocated from Brooklyn to Manhattan. She earned an M.A. from Teachers College, Columbia as a safety plan but was spending more and more time painting. Immersed in the exciting downtown art world amidst the burgeoning Abstract Expressionist movement, and at the urging of her friend Nell Blaine, Freilicher began studying with the famous painter and teacher Hans Hofmann. Freilicher loved how democratic the studio was and recalled how Hofmann's teachings "brought a kind of melding of the modern with tradition." This resonated with her even more deeply when she saw the Museum of Modern Art's 1948 Pierre Bonnard show; she appreciated Bonnard's "sensuousness and intimacy" as well as his treatment of everyday objects and interiors. Freilicher decided that Abstract Expressionism's elision of representation and narrative was not for her, admitting "I couldn't find a kernel in that kind of painting to split open. I have to struggle, to make something coherent, so the work engages me and leads me into some kind of struggle.... I felt I couldn't find a struggle within Abstract Expressionism." Instead, Freilicher painted interior and city scenes, portraits, still lifes, and landscapes, all with an expressive, meditative, and lush painterly hand. This placed her within the loosely-knit group of artists considered Contemporary Realists, though Freilicher deemed her own work "painterly realism." Freilicher's first solo show was at Tibor de Nagy in 1952 and received positive reviews. Writing for ARTnews, fellow painter Fairfield Porter deemed her work "traditional and radical" and extolled the work for being "broad and bright, considered without being fussy, thoughtful but never pedantic." Amid the larger-than-life personalities of the New York School, Freilicher continued with her own work, rooted in the world of quotidian objects and had no problem, in her words, "[standing] to the side a little, where I was anyway, and [going] on with what I was doing." One day in 1949, the poet John Ashbery, newly arrived to the city, knocked on Freilicher's door. He was picking up a key to the apartment of his college friend and fellow poet Kenneth Koch, who lived a floor below Freilicher. Freilicher invited Ashbery in for coffee, and this encounter led to a lifelong friendship, one that was mutually beneficial on a creative and emotional level. Ashbery called her "the wittiest person I have ever known," "screamingly funny," and "probably my favorite person in the world." He lauded her way of painting that was "constantly different, fresh, and surprising." Freilicher took her new friend to Rudy Burckhardt's shoot for his short film Mounting Tension (1950), which she and Ashbery ended up starring in along with Larry Rivers and Ann Aikman. Freilicher liked acting and also starred in Burckhardt's The Automotive Story (1954). Despite the stylistic differences, Freilicher was ensconced within the New York School, a term usually meant to be synonymous with Abstract Expressionist painters but was in reality far more diverse and included a host of other artists, including poets. As writer Jenni Quilter explains, "Freilicher occupied a singular position, inspiring an unparalleled devotion among her friends, particularly the poets." Frank O'Hara, in particular, wrote numerous poems for Freilicher such as "A Sonnet for Jane Freilicher," "Interior (With Jane)," and "Chez Jane." Freilicher married Joseph Hazan in 1957. Hazan was a wealthy clothing manufacturer and painter as well as a former dancer. The couple had one daughter, Elizabeth. Freilicher began spending more and more time in Long Island starting in the 1950s; Hazan built her a house in the small hamlet of Water Mill. There she painted still-lifes and landscapes, a perfect corollary to her Greenwich Village city scenes. Though Freilicher spent the rest of her life alternating between Greenwich Village and Long Island, she also had opportunities to travel. She went to Europe three times in the 1960s, visiting Ashbery in Paris each time, as he had relocated there. Together they went to Sicily, Barcelona, and the French countryside, as well as Spain and Morocco. Freilicher enjoyed raising her daughter (who later became an artist herself) and did not see motherhood as an impediment to her own artmaking. Being older and more financially secure when she had Elizabeth helped, but she also explained, "Even though my daughter was the most important thing, I never felt that I had to do everything, and be everything for her - I never had to take her everywhere and provide her with every conceivable lesson, the way so many parents do today." In 1975, Freilicher was one of 45 artists commissioned by the Department of Interior to make work for the travelling exhibition, America 1976, a show commemorating the country's bicentennial. Instead of travelling to paint an American scene, she decided to paint the familiar landscape of Long Island. She remarked, "I have to feel comfortable where I am.... I have to burrow in and feel at home." She was so closely identified with Long Island during her lifetime that the East Hampton museum, Guild Hall, honored Freilicher with a Lifetime Achievement Award in 1996, and in 2005, she received a gold medal for painting from the American Academy of Arts and Letters. Freilicher painted for the rest of her life. When asked in 1998 at the age of 73 about her decades-long preference for her subject matter, she stated amiably, "I suppose I'll just keep doing what I'm doing. Even though I'm using ostensibly the same subject matter, I keep on trying to get some other kind of sensation from it. Every flower has its own cosmology, its own relationship to the foliage, to the air around it." Freilicher died in her Manhattan apartment at the age of 90 due to complications from pneumonia. A December 12 birthday party hosted by the Poetry Project at St. Mark's Church went on as planned, becoming a celebration of her life and work. Eric Brown of Tibor de Nagy Gallery, the space in which she exhibited the entire length of her career, said upon her death, "An extraordinary artist and an exceptional friend, Jane will be profoundly missed. We will never forget her wit, her acute intelligence, her integrity and grace." Though grouped with the Abstract Expressionists, Jane Freilicher was not an abstract painter, instead choosing to spend decades painting intimate domestic interiors and still lifes, views out her apartment and studio windows onto the buildings and streets of Manhattan, and the verdant landscapes of Long Island. By remaining true to herself, she inspired other painters of her era such as Grace Hartigan, Fairfield Porter, Milton Avery, and Hedda Sterne in their engagements with representation. She was also profoundly important to the poets with whom she surrounded herself, such as John Ashbery, Kenneth Koch, and Frank O'Hara. Their poems about her and for her are a testament to her wit, creativity, warmth, and self-confidence. 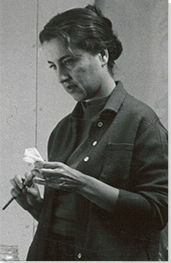 Though her reputation ebbed and flowed throughout the latter part of the 20th century, as art movements privileging sculpture, abstract painting, video, and installation unfolded, she remains a "painter's painter" and came to inspire feminist artists who admired her unabashed focus on private spaces and intuition as well as contemporary painters of still lifes and interior scenes, such as Jonas Wood, Rebecca Scott, and Tracy Miller. Her landscapes also remain iconic; fellow painter Eric Fischl commented, "To me, when I drive around [Long Island], I see her.... Her vision of it. She's so imprinted in my brain. You drive by a field, you say, 'Oh, my God, a Freilicher!'" A green glass vase with thin stems of purple irises sits in the foreground of the painting, perched atop a windowsill. Looking out the window, which is the entire canvas, the viewer can see the close and crowded buildings of New York stretched before them. Lights flicker in windows, smoke billows out of smokestacks, clothes on lines seem to sway, and the sky turns a dusky purple. Freilicher's brushstrokes are loose and casual, which creates an impressionistic sense of the constantly changing and vibrant city, but the tones of the colors are somewhat muted, as if to suggest that at dusk the city becomes quieter and takes on a more meditative mood.